Even a major clean up can be fairly easily managed if you don’t try to bite off too much at once. In this case, it was time (way past time) to clean our shed, which had not been attended to in the nine years we’ve lived in our house and which, in fact, contained items left behind by the previous owner. I spent a month working on it, once or twice a week, and never for more than an hour, except for the extremely pleasant afternoon I spent decluttering five bags of mulch and compost and some ground covers on a flower bed I enlarged. Here’s how I approached this task. Unfortunately, we are in a drought, so there was virtually no chance of rain. As I pulled each item out of the shed, I made a decision about its fate. Most everything went into these categories: metal recycling, trash, Habitat for Humanity Re-Store (a store that sells used and overstocked building supplies to support the charity Habitat for Humanity), sold on Craigslist, given to our eighth grade for their garage sale, or given to my mother. Before I stopped each day, everything was either in its future home or neatly piled waiting to go to its new home. 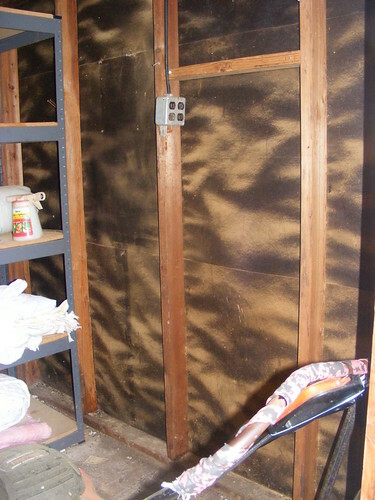 The shed had not been cleaned in any way in at least a decade and because it is somewhat poorly constructed, it is open the outside world in several places, so it was dirty and full of leaves, and rats had been using it as a shelter. Frankly, I’m just glad I didn’t find any rat carcasses! 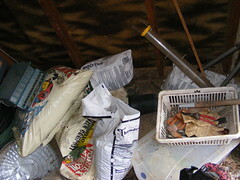 I swept the floor and the shelves as I went along and used old mulch bags as trash sacks. 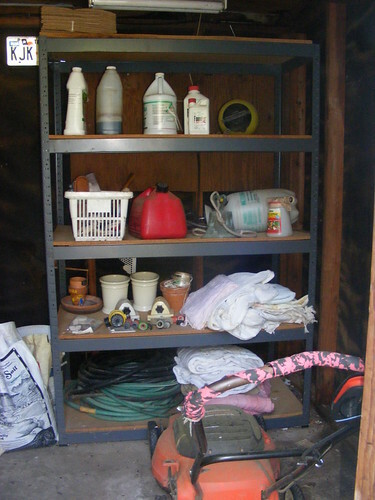 I did not put anything back into the shed until I was finished decluttering and cleaning. The reassembly probably only took 30 minutes. As I put things back, I gave them one more appraisal, knowing it might be a long time for the shed is decluttered again, but everything made this second cut. I took the advice of declutterers who recommend not going overboard: although I like things labeled, organized, and lined up in nice, straight rows, I remembered that this is a shed, not my kitchen and certainly not an operating room. It’s still a bit dusty, I didn’t clean behind the shelves (too heavy to move), and everything isn’t in a straight line. But, I have only things I will use, and like is stored with like. That’s good enough for this gal’s shed! a large box of sheets that I’d saved for wrapping plants, which I virtually never do. This was one time that I changed my mind. The sheets were too ratty (literally, sometimes) to donate to the thrift store, and I know of no fiber recycler in town. I put them in the trash but felt very unhappy about it. My mother encouraged me to get them back out and use them as a weed barrier under the mulch throughout the garden. I thought that was a fine idea and used five of them the day I enlarged the flower garden. The rest will go in the front yard when I next mulch. I’m completely satisfied with my efforts. 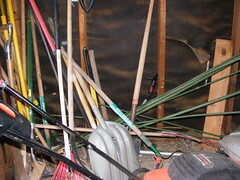 I would like to get some sturdy hooks to hang my garden tools, and I probably could have been more ruthless in a few cases, but it’s my shed, it’s clean, accessible, and organized, and that’s good enough for me. Wow! What a big differece! I say: totally worth the effort! It was worth it. Thank Nurchamiel. my son showed me that web site and is going to dismantle an old iPod (mind you he has retrieved it from the declutter pile, yikes!) and arrange it like they did with the camera parts on the site. I may have to mount it for him so he can hang it on his wall next to his arrangement of Apple product boxes. Oh my. I don’t like my things lines up quite that diligently, although I found the pictures intersting. Thanks for sharing. Cindy, congratulations on a job well done! I do understand. Thank Andreia. I think we’ll have to run a board across the lumber that supports the wall and put the hooks into that wood. Or…leave them leaning. You are really brave.There is no way I would show others the inside my two sheds.I kept one locked for years simply because Pop got such a thrill from showing others my junk.Now they are both left unlocked, but I rarely go inside,myself. There is no room left.Not even a path.I keep saying I will do something with my stuff one day, but that day never comes. the question to ask yourself is ~ If (God forbid) something should happen to you would you want one of your loved ones to have to deal with those sheds for you in their time of grief! That probably sounds a little harsh but sometimes that’s what it takes to get us thinking about the full ramification of our clutter. Sometimes the desire to ignore it and hope it goes away overrides the reality that its impact does not always only affect us. By the way you are showing up as being new here to the comments section of 365lessthings so I would like to extend a very warm welcome and I hope you will visit and interact often. We have quite a lovely community here that thrives on helping and encouraging each other and we would love you to be a part of that. I use this line of thinking a fair bit since experiencing something like it with one of my parents. I never want my kids to face that. I’ve run into naysayers who call that being pessimistic or gloomy – but I figure it’s no different from having insurance. You hope you never need it, but you get it just in case, and then your mind is at ease. Or, as they say, plan for the worst, but hope for the best! Sue, I was thinking along the same lines as Colleen and Jo. If you were embarassed by your father showing off your junk, think how you would feel knowing that not only were your loved ones looking at it, they were sorting it, hauling it away, etc. Not a happy thought. As for those naysayers, Jo, who don’t want you to plan for death. Well that’s just unrealistic. We all hope to live a long and healthy life, and I pray for that for all of us, but there’s simply no avoiding the fact that all life ends in death. Leaving the dirty details to others because we don’t want to deal with them ourselves is not a kindness, so good for you! Hi Sue! I think that everything that I really like I will keep till I die. But when I am old I would like to keep those in a box. Maybe it will be a big box (68 liters) like the one that have our photo albuns now, but I want my children to know that if it is not in that box, it is usables from the house. I didn’t declutter thinking I will die now (God forbid I have two babies! ), but they will grow up, they will wnat to have friends over and I want to have a house in complete use, and not have some rooms that can’t be used or no one can go in because of trash. You are wasting precious space and getting stressed by that place. Don’t think about the whole space. Open the door and take ONE THING you don’t want and throw it in the trash can. Don’t think too much either. You don’t go in there, so you problably never use any of that stuff anyway. One thing a day, that’s what Colleen has been telling us. It works and gets the job done. It might take a while, but you won’t give up or feel overwhelmed. Hope I have helped you. one thing a day would take care of it all in good time. It didn’t get there overnight so what does it matter if it takes a few weeks or even months to work on it slowly one thing at a time. Liberate the space and any items that may still be of use to someone else. Exactly, “leaving the dirty details…..is NOT A KINDNESS”. It’s not kind, it’s selfish and rude. Folks, I speak from experience. We can’t plan our death, of course not, but we can plan to keep it simple for our loved ones after we are gone. That means cleaning up/decluttering our stuff, having a will, living will, trust, plans for your estate, or whatever is needed, for when you are no longer here, etc. Just my thoughts & experience (I’m not giving legal advice, I’m not authorized to do so). Sue, you need to make ‘that day that never comes, come’. 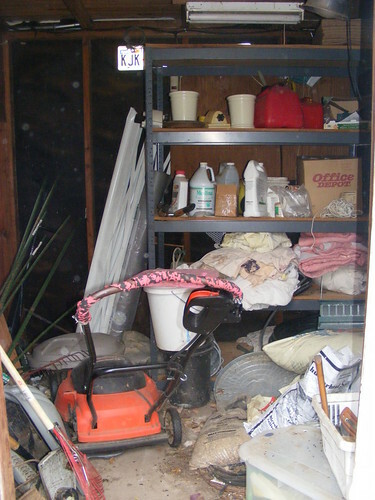 My aunt died several years ago, and she left THREE sheds (twice the size of what Cindy showed in the photos) and a LARGE house worth FULL of SH*T and CRAP. That, my dear, IS NOT A VERY NICE THING TO DO to ANYONE. My sister, her two kids and I had to SPEND OUR MONEY to travel to my aunts home, and in three days (on OUR TIME), we had to empty almost everything out of the entire house and sheds. MOST OF IT WENT DIRECTLY INTO THE TRASH. A lot of it was sold in a garage sale by a friendly neighbor (we let her keep the change!). About two truck loads of stuff was donated to a local thrift store. CLEAN OUT YOUR SHED(S) NOW. There’s no excuse. It is, in my opinion, extremely SELFISH & LAZY to leave such a mess for anyone else to clean up. Once those things are empty, STOP DOING whatever it is you do to make them get filled up again. Seriously, STOP. I don’t sugar coat anything. Specially since I’ve been a person who has had to clean up after a loved one has died. After that experience, my sister and I returned to our own homes (several states apart, and different from where my aunt had lived) and COMPLETELY cleaned up our own junk. We VOWED to each other to NEVER leave anything like what we experienced to ANYONE ELSE. that was straight to the point and I understand why. I have never been through this but I can’t imagine it would not be pleasant. The task keeps getting put off then at some point you realise that you can’t physically manage it any more and then it is too late and someone else has to deal with it. 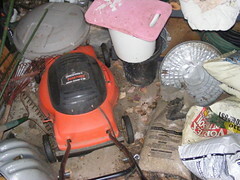 Like any other decluttering mission if you have to rush the job poor decisions are made and regrets are common place. Annabelle, That sounds like it was an awful experience. We once lived around the corner from a hoarder. When his house was foreclosed on, the new owners hauled everything to the curb for throw away. In addition to years worth of pizza boxes, there were tools, dishes, all the useful things of life. It made me almost weep to see the volume of waste. I love Andreia’s advice for dealing with the shed: Open the door, grab one thing you don’t want. Shut the door. Deal with your one thing. Repeat tomorrow. Slow but steady does win the race. And, after a bit, you’ll probably be able to grab two or even three things as a time, which speeds up the process! Cindy, wonderful job and especially keeping at it week after week. Sometimes it’s hard to keep that motivation, I find. Interesting use of the old sheets – great idea! I love that you salvaged everything that you could from this project. We have a curbside giveaway coming up in about a month – first one ever for our town – and I am ridiculously excited. I’m hoping to move a good bit of stuff from my basement and garage. where I live the local council operates the curbside pick-up. They recoup the cost by selling off the recyclable items. Recently in Brisbane the council tried to have a person charged with theft for taking stuff from the curbside. Their argument was the the stuff belonged to the council because they are the ones who arrange the pick-up. Sanity prevailed and the case was thrown out of court because all evidence pointed to the fact that most people who put stuff out are happy for anyone to take it away and reuse it so therefore the council has no exclusive claim to it. For our twice yearly bulky trash pick up, the good stuff is always gone by the time the city trucks roll around. People sometimes put really nice items on the curb knowing that they will be picked up and reused. In fact, my very handsome front porch chairs came from bulky trash pick up, but I did have to give them some love and a coat of paint. However, it is illegal to take recyclables (typically aluminum cans) out of people’s regular pick up bins. The city supports its recycling program by selling paper, plastic, and metal and to take it counts as stealing from the city. Wow, that is an amazing story. The legality behind that and what research and (local and countrywide) state law that covers that had to be quite interesting. Would have loved to have been involved in that case (ya know, like those who watch those crime shows love to figure out how to solve them!!!)! I’m truly surprised by the outcome, which appears to be more ‘user-friendly’ (for the people!) than the organization who was picking up the stuff. At the thrift store I volunteer for, stuff is left outside the doors when the store is closed. There are signs that state ‘the items here are thrift store property, taking anything from these piles constitutes theft’. So I don’t think they’ve ever truly prosecuted, which would be ‘tricky’, but in this case the stuff is intensionally left for the thrift store, not for someone else to sift through for their own good. It’s awesome that the organization does curb-side pick up. That option is available in so many places (countries) around the world. So folks who don’t have the means to haul stuff away can look forward to getting rid of stuff thanks to someone else’s initiative and hard work! Wow, the before and after photos are completely AMAZING! You tackled a HUGE project. WELL DONE! And what a great list you provided (that in itself is also a huge project!). I hate to tell you but there are seven mini missions so your average is not good I am afraid. You can redeem yourself if there were at least two that you didn’t need to do. Taking time off to enjoy beautiful weather is understandable though. We have had a beautiful weather week here as well and I have enjoyed every minute of it betting out and walking etc. A quick little bit of history, when I was going to high school I had a teacher who would let you off from not doing your homework if you could give a funny enough excuse to amuse him. The same man was also know to shove the boys up against the back wall when they pissed him off so you had to be real game to attempt to get away with the funny story. I did see it happen once of twice though. actually I loved him as a teacher but then I didn’t cross him either. I had very few teachers that I had great respect for but he was definitely one of them. Annabelle, It’s sounded to me like recently your weather has taken a turn to the beautfiul, so I say good for you for enjoying it. (Sorry Colleen, I know that’s not what I’m supposed to say!) Thanks for the praise and encouragement. As for the list, I like keeping lists because it gives me a real reminder of all I’ve accomplished. I have a spread sheet of everything I’ve decluttered in my (almost) a year, where it went to, and how much money, if any, I made. It’s interesting. Sue, I hope I haven’t scared you away from Colleen’s blog!!! 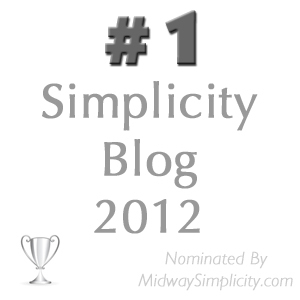 Please continue to share of yourself here on her blog!!! I’ve learned so much here from Colleen, Cindy and all the folks who leave comments. Forgive me, ok? I’m sorry if I scared you, I tend to come on real strong when it is a subject that is very near and dear to my heart. I’ve had such nasty experiences with dealing with loved ones stuff after they are gone, and I truly don’t wish that on anyone. So I speak my mind sharply on this subject!!! Just take it one day at a time if that is what works for you! Wow, what a difference Cindy: a fabulous job, well done! I love seeing before and after photos. And what is great, is that you know it will never get that bad again becasue you are training yourself into new habits. And, if an opprotunity comes to move unexpectedly, your life is going to be that much easier. Good luck with the garage…not that you need luck, you’ll just do it bit by bit. Although I am only in my 40’s, I am increasing concious of what I leave behind for others if I unexpectedly leave this planet early. More immediately relevant is what if I become too ill and need to move to accomodation without stairs and don’t have the strength/health to sort things then. OH has just returned from buying us a celebratory croisant each and it turns out he popped in to the charity shop and has bought himeself a pair of trousers. (This is the man with 5 times more clothes than he needs or uses already) I have suggested he adopts the one in one out rule and gets rid of something in exchange and he has agreed. Watch this space to see if he actually does it! Katharine, Colleen and I are both also in our 40s, and I have been fortunate not to have anyone I love die unexpectedly; however, I through both my church and my previous job, I know it happens. You’re right that perhaps you would need to move to a one-story home, or (something that could happen to me) a job loss could force a move. (Another unpleasant plan-ahead: We agreed how many months we would wait if he were unemployed before we would sell our house. It’s a beautiful house, and we love it and love our neighbors, but I’m not willing to lose everything else we’ve worked for in order to keep it.) Keeping our belongings to what we need and want would certainly make an unexpected move smoother. Mr. Too Many Trousers: One in, TWO out buddy! LOL Cindy!!! Love it!!! I’m going to use this line on my hubby too!!! Hi, I love reading about all the different opinions on here so thank-you. My mom was killed in a car accident 5 years ago. My 3 sisters and I had the job of going through all her stuff. She had moved several times and we were surprised about the junk (I mean precious treasures) she carted with her. A lot of it made us just laugh at what her reasoning was for keeping it. About 6 months after her death 1 of my sisters and myself decided we were not going to do that to our families and we starting getting rid of our stuff. My family knows I have one box that is stuff not worth anything to anybody but me (yearbooks, the last birthday card from my grandma, etc) and they can just throw it away after I’m gone. I love all the ideas and mini missions on here, they will have a lot less to go through thanks to this blog. So thanks again. Oh yeah the shed looks awesome my husband and I are working on ours I wished we would have taken a picture before we started. first of all let me say welcome to 365lessthings you sound like you have been reading for a while but I believe this is the first time you have commented and I wanted to say how wonderful it is to hear from you. So sad about your Mom, that must have been a terrible time for you and oh, how much you must miss her. I am glad that you have been inspired to get your own possessions under control so that they won’t be a burden to those left behind. I am glad my humble little blog has been a help to you in the process. It has been a pleasure to meet you and I hope we will hear from you again soon. Colleen, How terribly sad for you. My grandparents had lived in the same house for 30 or 40 years. When they passed, my cousin, his wife, and their three children moved in. The house has NEVER been fully decluttered! To some degree, it still contains years and years of my grandparents’ belongings plus everything my cousins, who already had a full home of their own, brought with them. Welcome to 365lessthings, and thanks for your encouragement on the shed. It’s not too late for you to take a picture. If you’re not finished, there will still be visible improvement. Fantastic job, Cindy! I had a similar shed at my previous house that turned into a scary job but once it was tackled the shed became so much more useful. 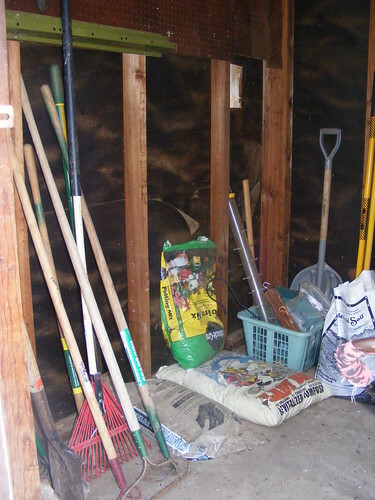 At our current house, the “shed” was the garage, because it was one of those long, narrow ones where the back never saw the light of day and included stuff left by the previous owner. Re all the comments about not leaving so much stuff behind for our loved ones to deal with in the event of our passing, I couldn’t agree more. Recently helped my parents sort through stuff in one upstairs room and could not believe the vast amount of stuff they’ve managed to collect and save. At the moment they are not speaking to me so I don’t know if the other room will ever get dealt with (it’s packed to the ceiling) during their lifetimes. I can honestly say I don’t want any of it. It makes me so happy to know that because I’ve sorted my own things and decluttered, I’m not leaving that kind of burden behind for my family–it truly lightens my soul! Oh dear, Meg. I’m sorry that your parents aren’t speaking to you. It’s a bummer that knowing no matter what, at some point you’ll have to deal with that room. Hi Meg I am also sorry that your parents aren’t talking to you at the moment. I can’t imagine that you would do anything to upset them so I assume it was one of those silly misunderstanding things. I hope the storm shall pass and you all make up soon. Life is too short to waste time being cross with those you love. When I bought my apartment, mine was the “runt of the litter” that didn’t get it’s own “caged off garage/storage” space – just two car spaces. Many people thought that this was a severe disadvantage and maybe because of this my unit was the last to sell and priced down because of it. However I thought this was great – no waiting for 2 automatic doors to open and no temptation to store any junk down there. Seeing the “glass half full” saved me a LOT of money and worry – the only thing down there, hanging in bags from hooks on the wall are two cat boxes for going to the vet…not much of score for potential thieves! Sue, like everyone says, take one thing out at a time and deal with it, pretty soon it will get better and you will realise from the feeling that that gives you, that you are on the right track. what is one person’s lost is another person’s advantage in your case. I like the idea of buying a place and getting it cheaper because you don’t need to store crap. I hope that happens to me if and when we ever decide to buy a home to actually live in. Oddly enough we have owned two homes and never lived in either of them.